October is Breast Cancer Awareness month and more and more departments across the country are wearing pink. 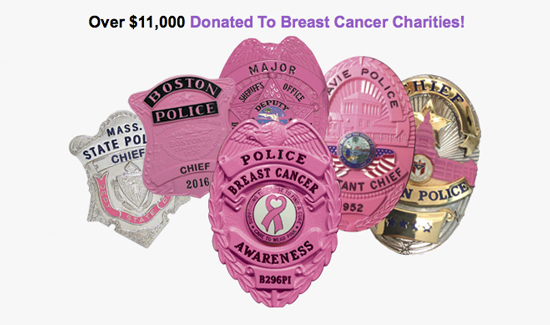 Blackinton’s line of Breast Cancer Awareness badges and insignia offers a great way for you to show your support. The company will again donate 10% of sales from its Breast Cancer line to the Gloria Gemma Breast Cancer Resource Foundation and the Firefighter Cancer Support Network. Over $11,000 has been raised to date. September 9 is the deadline to order a Blackinton Breast Cancer Awareness badge to ensure it ships by September 30th. The deadline is for orders of under 100 badges; for larger orders, dates will need to be negotiated. Blackinton offers seven of its most popular badges as part of this line, but you are not restricted to these seven badges—most of its extensive line of badge styles can be finished pink! Place your order today by contacting a Blackinton dealer. To find an authorized dealer in your area CLICK HERE. For more information, click here or download their flyer.